What is a New Offer? Since no sale-specific information is carried over to the new transaction, creating a New Offer transaction keeps sale documents, tasks, and other activities separate. Open the transaction and click [New Offer] from the left menu. 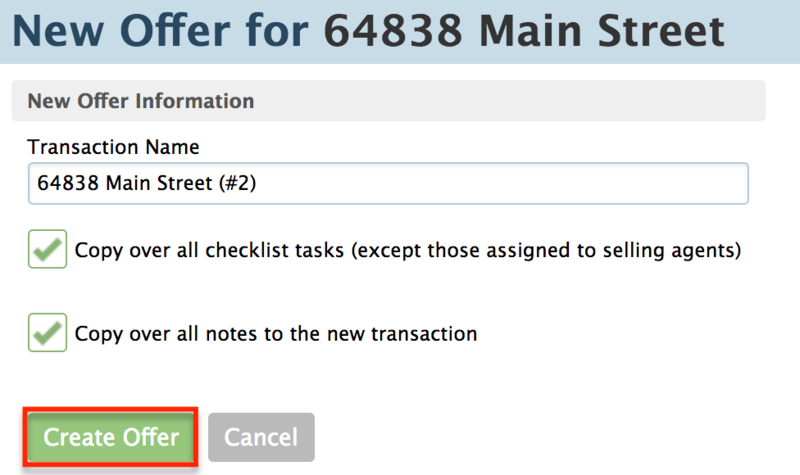 Check [Copy over all checklist tasks] and/or [Copy over all notes to the new transaction] to copy all items from the original transaction to the New Offer. If you don't want the checklist tasks or notes copied, leave the boxes unchecked. Click [Create Offer] to create your New Offer. All New Offers are linked in the "Original Offer" box of the original transaction. When creating a New Offer, you can choose whether you’d like checklists to be copied over. Checklist tasks visible only to selling agents will never be carried over. The New Offer feature is most appropriate for managing multiple offers on a listing. This feature is most useful when a pending offer on a listing has fallen through (or was cancelled/terminated for any reason) and there's now a New Offer on the same listing. This feature is also useful when a deal has fallen through and you now need to track new activity on the deal isolated from the fallen-through transaction. When a subsequent New Offer comes in. Do not use New Offer for the first offer. Store the first offer in the original transaction. Re-list a transaction whose offer has fallen through. Add a backup offer on a transaction. Each New Offer transaction can be handled the same as any other transaction, with its own tasks, status changes, and other activities that can be managed independently. For example, if any particular offer closes, update the status in the appropriate transaction. Store the original offer information in the original transaction. If that offer falls through, then create a New Offer to separately track the two offers. And if that falls through and there's an additional offer, add a second New Offer to track the three of them separately in separate transactions - and so on. This Pipeline Pro session covers the New Offer feature: how it works, when to use it, and all its wonderful perks.